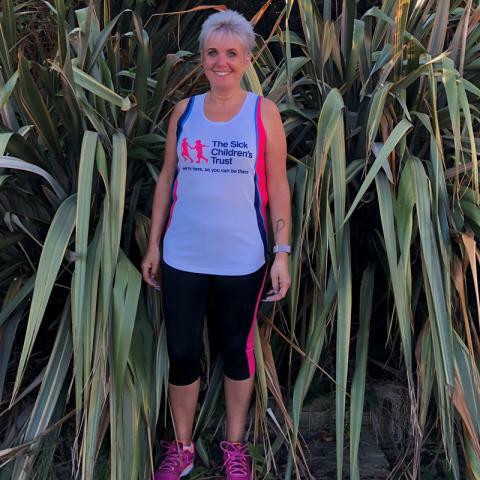 Jackie is running the Great North Run to raise money for Crawford House. 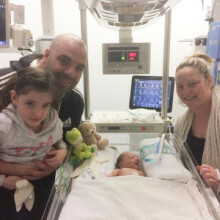 A Workington woman whose children were seriously hurt in a house fire and required specialist hospital treatment over 90 miles from home is lacing up her trainers to raise money for The Sick Children’s Trust, a charity that supported her during this time. Jackie Kirkbride, 51, experienced everyone’s worst nightmare when her house set on fire as she slept. Her two youngest children, Michaela and Jamie Atkinson, then just nine and six years old, were trapped in their room as heat and smoke quickly filled the house. As they waited for help, the children opened the bedroom window in a desperate attempt to reach clean air. However, Jamie lost his balance and fell 15ft from the window. He was knocked unconscious and rolled into the fire. In a bid to rescue her brother from the flames Michaela courageously leapt out the window after him, breaking her ankle, and pulled her brother from the fire. Jamie, who suffered 27% burns, was rushed to Newcastle’s Royal Victoria Infirmary where he spent three months undergoing lifesaving treatment. During this time, Jackie, along with Michaela and eldest son Mark Farragher who had been on a school trip at the time of the fire, was given free ‘Home from Home’ accommodation at The Sick Children’s Trust’s Crawford House. “I can’t describe how traumatic it was. I managed to get out of the house with minimal injuries, but my two youngest children were seriously injured. Jamie had severe burns and was rushed to Newcastle in an attempt to save his life. He spent three weeks fighting on the intensive care unit and a further three months undergoing numerous operations. Without Crawford House I honestly don’t know how I would’ve coped. I nearly lost my children. The pain was unbearable. 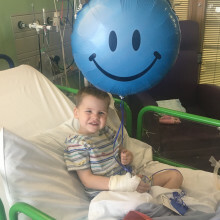 But being able to be by Jamie’s hospital bedside because of the free accommodation that The Sick Children’s Trust provided made a huge difference. At least I could be there to comfort him and we were able to stay together as a family. “Crawford House really did become our ‘Home from Home’ for three months. We were all trying to stay positive for Jamie, but sometimes we just needed a few minutes off the ward to have a cup of tea and gather our thoughts. Crawford House has such a homely environment too, so much so, that when family came to visit we would take them over, sit them in the living room and chat like we would at home. Time out at Crawford House really meant a lot to us, it was so good for our wellbeing. 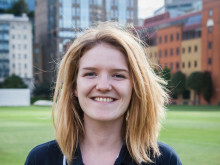 “We supported Jackie nineteen years ago and are overjoyed that she has decided to take on this huge challenge to thank us for being there for her during such an awful time in her life. Steven Saunderson, 46, is taking on the Great North Run on Sunday 9 September to support The Sick Children’s Trust, a charity which kept him by his 19-month-old son Murdo’s hospital bedside throughout months of treatment. 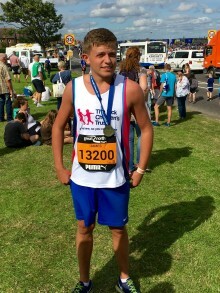 A South Shields man who survived being hit by a bus at just 11 years old is taking on the Great North Run for the second time on Sunday 9 September for The Sick Children’s Trust. 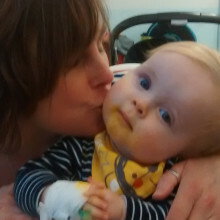 Claire and Alex, from Hemel Hempstead, are asking people to get involved with The Sick Children’s Trust’s Pyjama Party campaign to help the charity support more families, like theirs, when their child is seriously ill in hospital. Gareth Wood is gearing up to take on the 2018 Screwball Rally this month in memory of his baby, Lewis, who tragically passed away at just four days old.